New York: Harper & Row. As New. 1986. Hardcover. 0060155132 . *** FREE UPGRADE to Courier/Priority Shipping Upon Request ***   *** IN STOCK AND IMMEDIATELY AVAILABLE FOR SHIPMENT - Text pristine, clean & unmarked, tight to spine - 426 pages. 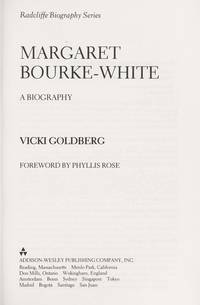 From Publishers Weekly: "Goldberg, a freelance journalist, recounts Bourke-White's achievements as the first woman photojournalist accredited to the U. S. Armed forces. PW called this an "insightful, impressively researched biography that portrays a brave, dramatic and oddly vulnerable woman. " -- with a bonus offer . New York: Harper & Row. 1986. First Edition; First Printing. Hardcover. 0060155132 . Very Good in a Very Good dust jacket. Dust jacket soiled lightly. Front panel off-kilter, facing downards to the right. ; 9.40 X 6.40 X 1.70 inches; 426 pages; Original unclipped dust jacket protected by archival Brodart cover. All domestic orders shipped protected in a Box. .
1986-04-01. Good. Ships with Tracking Number! INTERNATIONAL WORLDWIDE Shipping available. May not contain Access Codes or Supplements. May be ex-library. Shipping & Handling by region. Buy with confidence, excellent customer service! New York: Harper, 1986. Hardcover. Very Good. First edition. Very good hardcover with similar dustwrapper. First edition. Signed by the author on title page. Pages clean. Illustrated in black and white photos. Dark blue cloth cover. Very small nick on top edge on rear dustwrapper near the spine. HarperCollins. Hardcover. 0060155132 New Condition. . New. Addison-Wesley. PAPERBACK. 0201098199 New Condition. . New. Harpercollins, 1986-06-01. 1. Hardcover. Used:Good. Harpercollins, 1986-06-01. Hardcover. Like New. Signed by Author. Like new hardcover with DJ. FIRST EDITION. An unblemished copy. SIGNED BY AUTHOR (name only...no inscription). Contains a remainder mark on bottom page edge. ; 100% Satisfaction Guaranteed! Ships same or next business day! New York: Harper & Row, 1986. Hardcover. Fine/Fine. First edition. Tall octavo. Fine in fine dustwrapper. Signed by Vicki Goldberg. LONDON: HEINEMANN. VG/VG-. 1987. 1st Edition. DJ SHOWS SLIGHT SHELF WEAR AND 1 1 INCH TEAR ON EGDE OF FLAP . Reading MA: Addison-Wesley, 1987. Stated 1st Printing.. Trade paperback in b/w photo wraps.. New.. Brilliant account of of a monumental figure. Mint new copy of PB 1st printing. Publishers promotional card laid-in. 6-1/4 x 9-1/4, 426 pp, index, bibliography, notes, b/s photos sections. HarperCollins. Hardcover. 0060155132 Like New Condition. . Fine. Harpercollins, 1986 book is tight with no markings, authors short inscription and signature on title page, dj has minor curling/creasing along the edges . Signed by Author. First Edition/First Printing. Hard Cover. Very Good/Very Good. 8vo - over 7¾" - 9¾" tall. Harper & Row, 1986. First edition, first printing. Slight discoloration to upper edges, still near fine in fine, faintly rubbed dust jacket in mylar cover. Condition: Slight discoloration to upper edges, still near fine in fine, faintly rubbed dust jacket in mylar cover. Scarborough, ON, Canada: HarperCollins Publishers Canada, Limited, 1986. 1st Edition. Cloth. Very Good Plus/Very Good Jacket. Book. 8vo - over 7¾ - 9¾" tall. A little soilage on black cloth. Otherwise would be fine. VG DJ. Harper & Row, 1986. pp.426 with index b/w photos. clean tight copy. Hard Cover. Fine/Fine. 8vo - over 7¾" - 9¾" tall. New York: Harper, 1986. First. hardcover. near fine/near fine. Illustrated with black and white photography. 426 pages. tall 8vo, black cloth, dust wrapper. New York: Harper (1986). A near fine copy in a near fine dust wrapper. New York: Harper, 1986. Hardcover. Very Good/Good. First edition. Very good hardcover with good dustwrapper. First edition. Pages clean. Illustrated. Light faded spots on rear blue cloth cover. Missing front dustwrapper flap. Please Note: This book has been transferred to Between the Covers from another database and might not be described to our usual standards. Please inquire for more detailed condition information. Harper & Row, 1986. 1st printing. Red remainder stamp to lower page edges, otherwise a clean and unmarked copy. Full cloth binding. 426pp. Unclipped jacket now in a new mylar cover.. First Edition. Hardcover. Very Good/Very Good. 8vo - 8" - 9" Tall. NY NY: Harper & Row. Very good clean unmarked copy. Appears unread. Repaired jacket still attractive. No remainder or other markings. . Very Good. Hardcover. 1st Edition. 1st Printing. 1986. Harper & Row: New York, n.d.(1986). First Edition, 2nd printing., 1986. Book. Hardcover. Full cloth; 8vo.,426pp. Photo illustrated. Name f.e.p., else V.Good+ in V.Good+ D/j. New York: Harper & Row. VG. 1986. Harper & Row, 1986. 1st Edition 1st Printing. Hardcover. Very Good/Very Good. 8.98 X 6.06 X 0.87 inches. Very Good/Very Good condition. First edition, first printing. No markings to the text block. No marks of personal identification or prior ownership. Edges of text block lightly soiled. Dust jacket with several small tears and light edge wear. DJ in Brodart cover. HarperCollins, 1986. First Edition. Hardcover. Very Good/Very Good. 8vo - over 7¾" - 9¾" Very Good condition in Very Good dust jacket. Clean interior. Light shelf and handling wear. Harpercollins. Used - Acceptable. Ships from Reno, NV. Former Library book. Shows definite wear, and perhaps considerable marking on inside. 100% Money Back Guarantee. Shipped to over one million happy customers. Your purchase benefits world literacy!